The Battle of Gettysburg was fought on July 1, 2, & 3, 1863. Just recently, we, as a nation, commemorated the 150th anniversary of the battle. I've been to the battlefield many times both for my own personal education and with the students in my American History classes. Today I learned something about the battle that I did not know. My son, Alex, had a fall baseball game in Hanover, Pennsylvania today. I had some time to kill before his first game started...so naturally I brought my bicycle with me. 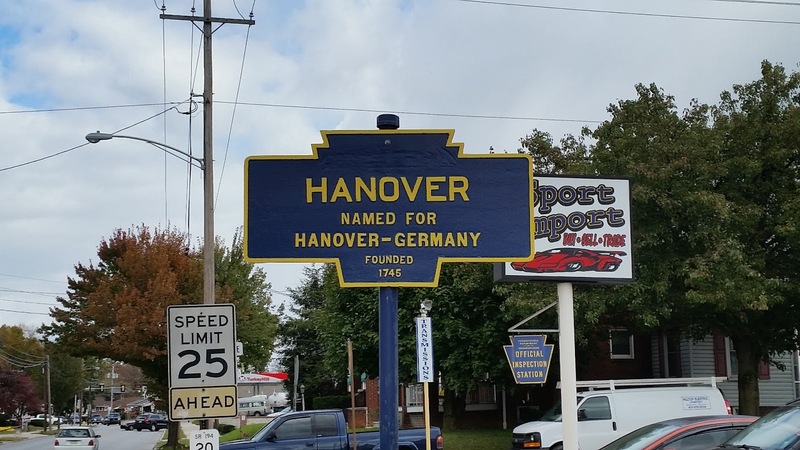 My ride today took me from Hanover to Littlestown. 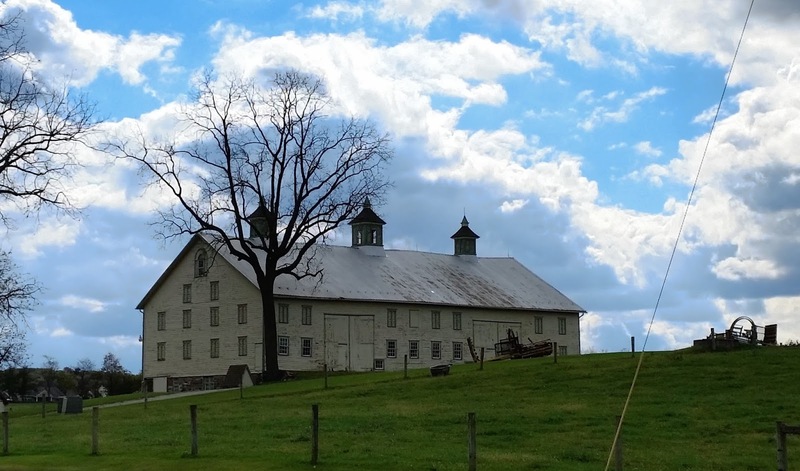 I rode in a straight line out and back on the Hanover Pike taking in some really beautiful York & Adams County scenery. The cold front that was passing over south central Pennsylvania today provided a brilliant autumn sky. 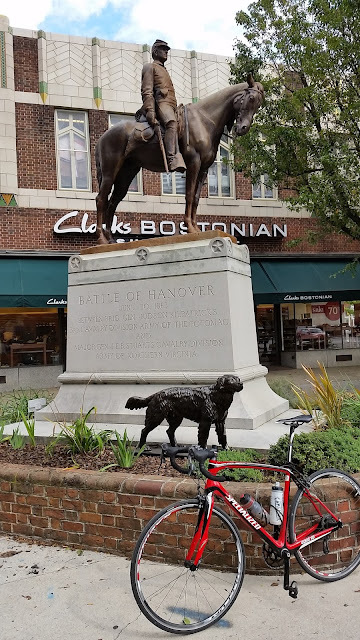 Pedaling through Hanover I was startled to see the Civil War statues and artillery pieces that were in the town square. I shouldn't have been surprised. I knew that both Union and Confederate troops passed through Hanover during the Gettysburg Campaign...but I had never actually heard of the Battle of Hanover. Serving as the eyes and ears for Confederate general Robert E. Lee, J.E.B Stuart, and his cavalry unit, rode north towards Pennsylvania and around the Union army. In the process he would gather information about Federal troop movements while also disrupting communications and supplies. Stuart would then report directly back to Robert E. Lee. Before crossing into Pennsylvania, Stuart captured a large Union wagon train full of provisions...but it slowed him down. As he crossed the border into Pennsylvania he found that there was a portion of the Union army between him and General Lee. He had no way to report to his commander. 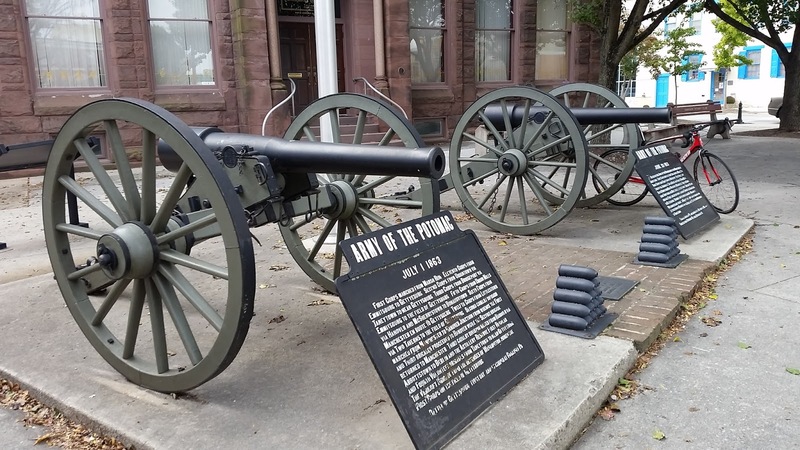 Approaching Hanover on June 30, 1863...the day before the Battle of Gettysburg...Stuart's cavalry unit encountered a Union cavalry division led by Brigadier General Hugh Judson Kilpatrick. (An interesting side note: Kilpatrick's unit included Brigadier General George A. Custer's brigade.) After severe fighting in the streets of Hanover, the Confederates were chased out of the town by Federal horsemen. Without word from Stuart, General Robert E. Lee began to mass his troops near the town of Gettysburg. The wayward Stuart did not arrive in Gettysburg, Pennsylvania until late on the second day of the battle. The rest is...as we say...history. Yes...like I tell my students...I am a nerd. I'm just fortunate that I live in an area that affords me the opportunity to ride my bike, continue my life long learning, and catch my son playing ball. Way cool.